Hello, Beautiful! Today’s featured cake is a purple ombre wedding cake. And I L-O-V-E it! This incredible cake was designed for a fun Pinterest-inspired wedding shoot in Virginia, and was featured on Ruffled Blog. AND – one of our favoritest bakers, Kara from A Cake to Remember in Richmond, Virginia, created the gorgeousness! 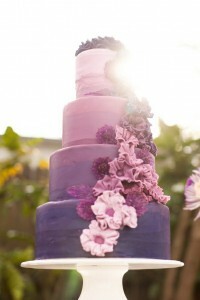 If you haven’t gotten your fill of ombre wedding cakes, check out our others we’ve featured here and here.